Narak Kong Shak (Tib. ན་རཀ་སྐོང་བཤགས་, Wyl. na rak skong bshags) is a famous practice of confession and fulfilment associated with the Narak Dongtruk ('Emptying the Lower Realms from their Very Depths') tantra. It is known as one of the most powerful and important methods or practices of confession within the Nyingma tradition, and is also a particularly powerful prayer for those who have died or are ill.
Narak Kong Shak is associated with the Narak Dongtruk ('Emptying the Lower Realms from their Very Depths') tantra, and compiled from the Kagyé Sangwa Yongdzok, which is a revelation of Guru Chökyi Wangchuk, and the Kagyé Drakpo Rangjung Rangshar of the Northern Treasures. The practice of Narak Kong Shak is known as one of the most powerful and important methods or practices of confession. Galwa, a breakage not confessed within a period of up to twenty-four hours. Depa, a breakage not confessed within three months. Ralwa, a breakage not confessed within three years. Once three years have elapsed, according to some tantras, a breakage is ‘irrevocable’. The Narak Dongtrul Tantra, or Narak Kong Shak, has special features. [First], it enables us to purify any kind of breakage, regardless of how much time has elapsed. [Second], all the different categories of breakages may be purified not only by the one who committed the action, but also by somebody practising on his or her behalf. The full title of the practice we call Narak Kong Shak is: Narak Dongtruk (Emptying the Lower Realms from their Very Depths): The Sovereign Practice for the Confessions of all Violations and Breakages, Negative Actions and Obscurations. Prostrations — Confession of samaya breakages committed with the body. The Hundred Syllable Mantra recitation — Confession of samaya breakages committed with the speech. The practice of Narak Kong Shak is known as one of the most powerful and important methods or practices of confession. This confession practice is done on 'tsok days' (the 10th and 25th days of the lunar calendar), at the very least, and is traditionally also done on sojong (healing and purification) days by monastics. It is also a particularly powerful practice for those who have died or are ill.
A long time ago, there lived a Brahmin called Conch Necklace. He had a son who died and took rebirth in the hell realms. Conch Necklace was distraught, and he prayed to Vajrasattva, requesting a practice that might purify his son’s harmful actions and obscurations. 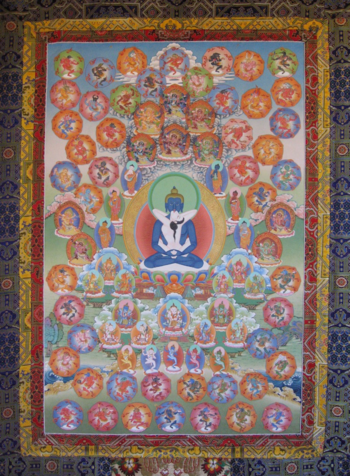 In response to his request, Vajrasattva taught him the Narak Dongtruk Tantra. Later, through practising this tantra, Conch Necklace was able to liberate his son from the hell realms. It is taught that the only good quality of negative actions is that they can be purified. And it is true to say that if we visualize the peaceful and wrathful deities, the buddhas of the five families and so on in the sky before us, and then prostrate ourselves before them, while confessing our misdeeds with heartfelt regret and resolve never to repeat them, they will be purified. We should be confident about this. This is something the Buddha himself said: if we confess them, the ten negative actions such as taking life will be purified. Even grave negative actions, like the five crimes with immediate retribution, can be purified if the confession is completely heartfelt. We can refer to the story of Angulima, for example, who murdered 999 people but still attained the level of an arhat. Or there is the case of King Ajatashatru, who killed his father, but was prevented from falling into the lower realms. ↑ Orgyen Topgyal Rinpoche explains, ‘This is a brief fulfilment which combines these four offerings of amrita, rakta, torma, and light’. Guide to Vajrayana Practice for the Rigpa Sangha, section 5. Narak Kong Shak (The Tertön Sogyal Trust: 2006).